Good customer service is the lifeblood of any business. It is the fuel that keeps a business running and the rudder that steers the ship. Providing excellent customer service can create lifelong customers and strengthen the bonds with existing clients. One of the most often quoted advantages of being a small business is the ability to personalize the experience your customers receive by giving each buyer individualized attention. Beyond the product or service you’re selling, good customer service lends itself to returning, loyal customers. 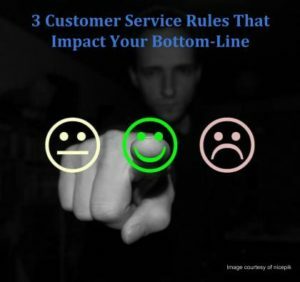 In an ever-changing marketplace, the tricks of the “good customer service” trade may seem elusive, but the truth is, they couldn’t be simpler. This may seem obvious but more often than not, the most off-putting thing a business can do to potential clients is make them feel alienated by seeming unreachable. Hire specialists to field customer calls. Your customers will love speaking to a real live person instead of being forced to navigate those infuriating automated messaging systems. The simplest secret to superb customer service, listening. A strong skill set in listening will allow your employees to connect with your customers in the most immediate sense. Back in 1957, researchers found that “listeners only remembered about half of what they’d heard immediately after someone finished talking.” This reinforces the importance of clear communication, on both sides of the conversation. If you’re ready to transform your customer service into a world-class service, then you need the systems in place to make that happen. That’s where we come in. At XBLUE, we value our employees and we value you, which is why we provide locally-staffed specialists ready to speak to you whenever you need them. XBLUE designs and delivers office phone systems for businesses with 3 to over 300 employees. Our U.S. based product support team is available to help you design the perfect phone system for your business needs. For more information, visit XBLUE.com or give us a call at 866-925-8312 to speak with an XBLUE Business Communications Specialist.